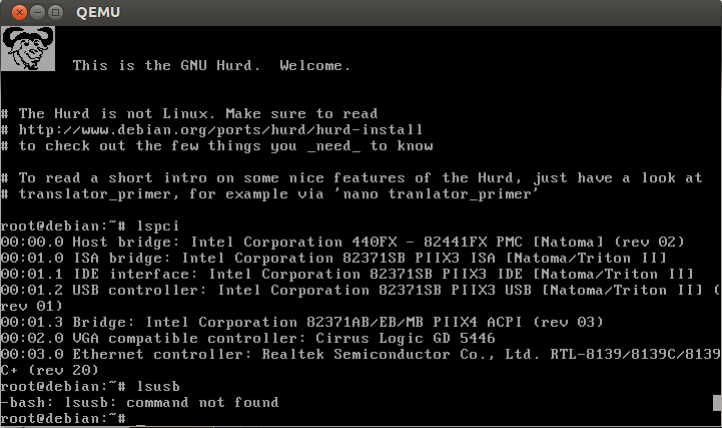 While I have been using Linux for a number of years I only recently discovered the existance of the Hurd. I would like to work on getting USB hardware support and Audio into the Hurd because let’s face it, everyone loves listening to music and what could possibly be better than a totally ‘free’ operating system that can play and record high quality audio? To assign an existing host USB device to a VM Guest, you need to find out its host bus and device ID. In the above example, we want to assign a USB sound card connected to the host’s USB bus number 2 with device number 5. PCI Pass-Through is a technique to give your VM Guest exclusive access to a PCI device. I believe it would be useful for setting up a virtual environment for developing more PCI hardware support for the Hurd.